Most SEO best practices posts don’t tell you anything new. The posts usually contain the same old SEO information and the writers simply add the current year to the title. We want to be different. This post is going to cover the SEO best practices you won’t hear anywhere else. Above and beyond the normal advice like “create epic content or use the Skyscraper technique” we’re going to look at SEO insights that really move the needle. The SEO industry has a lot in common with the weight loss, self-help, and finance industries. 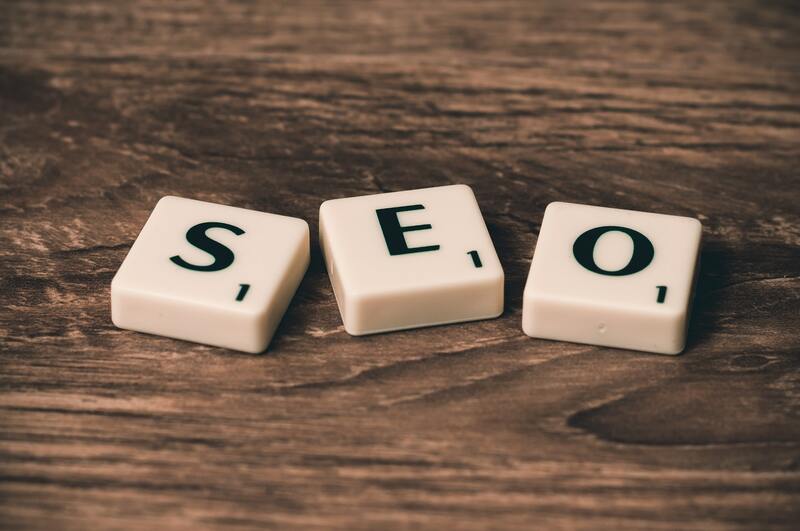 In the case of SEO, the common advice would be something like “perform outreach to get backlinks” and the advice of the day might be in relation to the latest algorithm change. In all cases, you’re choosing the wrong strategy if you dwell too long on either type of advice. Instead of reading articles about writing epic content, write epic content (or hire someone to do it) and measure the results. Instead of watching videos about blogger outreach, take the last piece of content you wrote and promote it as hard as you possibly can. If you’re a business owner who’s on the fence about working with an agency or getting marketing help, stop reading blog posts about “finding the right agency,” pick one and give them 12 months to build a successful campaign. SEO has much more to do with implementing sound advice than it does being an expert. Imagine you’re a local business owner in Cleveland, Ohio who sells plumbing services. You think you’re in a “boring” business. With that belief in mind, you don’t go the extra mile when it comes to marketing. Maybe you try writing some SEO content, but you don’t take it any further. You can’t see past ranking #1 for “Plumbing services in Ohio.” You have modest goals because you run a modest business in a modest industry. Instead of doing what every other plumber in the city does and wishing for the best, why not go above and beyond your competition — not just in SEO, but building a brand that stands out in your entire industry. 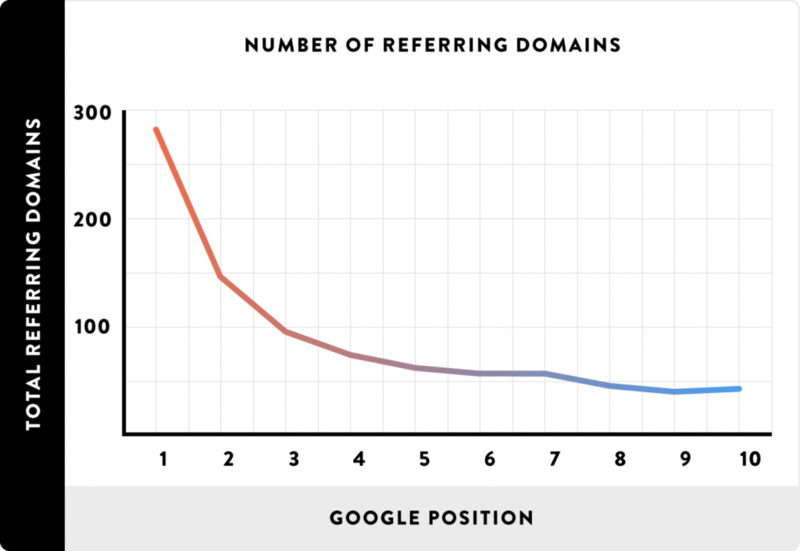 You’ve heard that backlinking is a key piece of the SEO pie, but what if I told you there were websites earning tens to hundreds of thousands of visitors per month without actively backlinking at all? Enter the Cup and Leaf Blog. Nat Eliason, owner of Cup and Leaf, Growth Machine, and a fascinating personal blog, has been growing his tea blog by using something called the wiki strategy. The first principle of the strategy is that you should only write something if it’s going to be the best article on that topic on the Internet. Anything less than that is a waste of time. If there is already a better article on the topic out there, then you’re only adding to the infomania pollution of the Internet by publishing yours, so you must only publish something if it is truly the best article on the topic. Because it focuses on the user first and SEO second. Google is not (just) interested in your website’s authority score. It’s interested in whether or not your website — and business as a whole — serves the needs of searchers. When it comes to creating content, designing your website, creating a site structure, and more, start with the premise that you want to provide the best user experience possible. After you’re done, go back in and use the core SEO techniques. Remember when I said SEO and marketing are a lot like finance, weight-loss, and self-improvement? The need to commit to goals. Consider adding the commitment to your company’s marketing to your list of goals for 2019 and follow through with it. SEO can take up to a year before it really starts to kick in — just like losing weight or saving money. This year, consider suspending your judgment and spending a full 12 months — either on your own or with the help of an agency — doing a full scale 100% effort digital marketing campaign. You want to have enough keywords to create as many new pieces of content you decide you need for the next 12 months. Keep these thoughts in mind while you research. In our article about real estate SEO, we talked about how hard it would be to rank on the first page for a key phrase like “Homes for Sale in Minneapolis,” without a big brand with a lot of authority. We suggested focusing on less competitive long-tail keywords like “Condos for sale in Stillwater, MN. (Stillwater is a suburb of Minneapolis. Creating unique pages for these types of key phrases can help you grow your organic traffic as a whole over time. 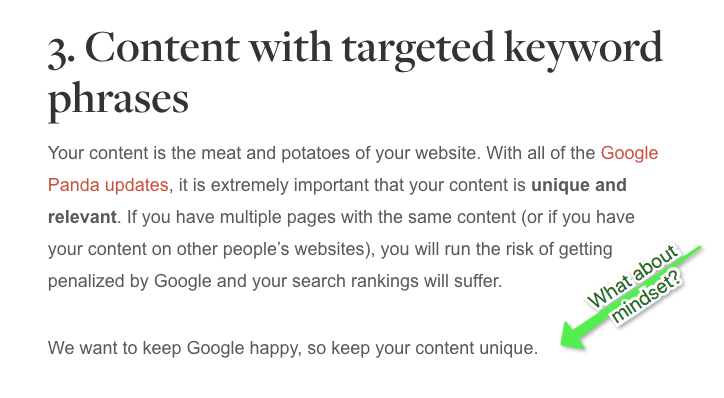 There are a ton of articles about ways to verify the quality of your keywords. One piece of advice many business owners — and even SEOs miss — is taking the time to read and analyze the content that appears on page one. It seems simple and obvious, but reading and analyzing 10 blog posts or website pages requires time, patience, and effort. Our analysis found the following. This led to us creating tips not just about SEO best practices, but the behavior and mindset you need to pull them off. We also noticed the #1 result came in at about ~1,100 words. Is that really enough word count to explain SEO in detail. We don’t think so, so we doubled the word count with useful information. How do you become an industry thought leader? How do you build an audience that respects your opinion? You only talk about topics you know inside and out and avoid everything else. Artificial intelligence and voice search are hot SEO topics — ones we’re fascinated about and plan on focusing on more in the future. But, as of this moment, we’re not trying to become the go-to experts about these topics. First, because we focus on providing useful content for business owners and marketing employees, we want to write about topics that are the most actionable for our audience. We’re not discussing A.I. in strategy meetings with potential clients, so why write about it? Second, as of this moment, we simply can’t write about those topics with a level of authority we’d feel comfortable with. This is the exact opposite attitude of many other SEO companies and digital marketing agencies. They might write a paragraph about artificial intelligence in their blog post, but if you reached out to ask them to build a custom A.I. based digital marketing strategy for you, they wouldn’t be able to do it. SEO is at the peak of competitiveness in 2019. Writing “me-too” content isn’t going to work. Mentioning topics that are hot and trendy, but you know nothing about, won’t work either. Focus on becoming the best at what you know and sharing it with your audience. This 80/20 approach will reap massive rewards. You have your content planned out for the year, but written content can’t be your only content marketing channel. The goal and steps are simple — test marketing channels and run experiments until you find a channel worth mastering. You don’t want to throw spaghetti at the wall forever. When you find a channel that works, do it again. “Everyone who’s ever launched a product—a book, an event, a course—has asked this question. It’s the number-one question every amateur entrepreneur wants answers to. It’s the question I asked after launching my first product. And it is absolutely the wrong question to ask. I made the mistake of asking this question to Derek Halpern right after my first successful course launch. “What should I build next?” I asked Derek. “Whaddya, stupid? !” Derek said in his most wonderful New Yorker accent. Once you find a marketing channel that works for you – double, triple, or quadruple down on it. Here are some excellent examples of people doing just that. Neil Patel owns an agency called Neil Patel Digital and runs a popular marketing blog. Eric Siu owns Single Grain, Growth Everywhere, and a SaaS product called Click Flow. Together, they both host the Marketing School podcast where they create a short daily episode about marketing. They’re building towards an end goal. They started the podcast as an experiment and doubled-down on it when it worked. What do other marketers do? They either rest on their laurels or try a new strategy. You should try new strategies – Eric and Neil both use many other marketing channels – but only after you’ve mastered and optimized a channel or technique that’s working. You want to track the success of your marketing efforts, but that’s not the most important part of a successful campaign. Let’s (for the last time) take a look at one of the related industries we talked about earlier — finance. […] managing money isn’t necessarily about what you know; it’s how you behave. But that’s not how finance is typically taught or discussed. The finance industry talks too much about what to do, and not enough about what happens in your head when you try to do it. This quote doesn’t just describe finance, but many other industries including SEO. See, it’s easy to nod your head when you work with an agency and they tell you that SEO takes 12 months. It’s hard to stick with the campaign after you’re 6 months in, spent $15,000 on the campaign, and haven’t got the flood of traffic you hoped for yet. Facebook ads seem like a great way to promote your content. But sticking with them when your ads are bleeding money could mean the difference between disappointment and marketing pay dirt. Our SEO best practices guide contains much less tactical information and much more behavior-oriented and psychological information. Why? Because winning the SEO game is about what goes on between your ears, not the techniques themselves. Trust the process long enough to get real insights. The SEO best practices that work have nothing to do with simple techniques and strategies. Often, they have more to do with comittment, persistence, and long-term thinking. Are there any SEO best practices you’d like to add?